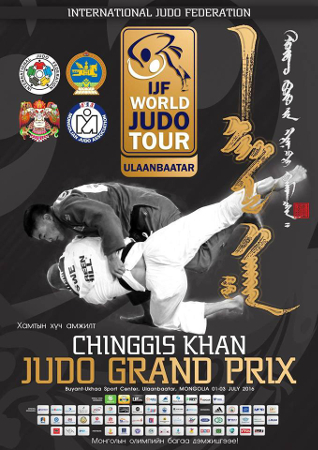 The IJF World Judo Tour 2016 has arrived in Mongolia for the Ulaanbaatar Grand Prix 2016 - the final IJF Grand Prix before the Rio 2016 Olympic Games - which takes place from Friday 1 July to Sunday 3 July at Buyant Ukhaa Sport Complex. Ulaanbaatar, which means ‘Red Hero’, is the capital of judo in the country and is a sophisticated city on the Tuul River that beautifully blends its picturesque countryside with urban zest, commerce and is ripening as an ever-changing hotspot for tourists. The fourth edition of the annual leg of the IJF World Judo Tour is the first IJF event in Asia this year and is the year's seventh and final Grand Prix before the Olympic Games in August. The road to Rio 2016 will make one final stop before Rio de Janeiro as the circuit reverts back to Europe for Russia’s Tyumen Grand Slam from 16 to 17 July. Hosts Mongolia have selected a 56-strong team with four judoka in each of the 14 weight categories. The Mongolian Judo Association, who provided their country’s first Olympic gold medal when NAIDAN Tuvshinbayar won the -100kg title at the Beijing 2008 Olympics, have picked a handful of members of their Rio 2016 team such as former world champion MUNKHBAT Urantsetseg (MGL) but will also blood youngsters as they prepare to switch their focus to Tokyo 2020 in the coming months. 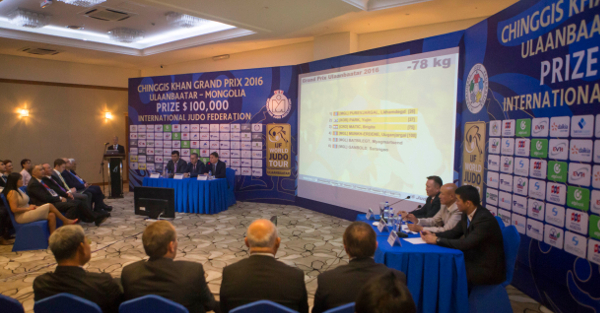 The draw took place on Thursday afternoon as Mr. Vladimir BARTA, IJF Head Sports Director, revealed that 126 judoka (65 men, 61 women) will be engaged in action from 13 nations in Ulaanbaatar. International stars in action include Olympic champion Idalys ORTIZ (CUB), Olympic silver medallist and former world champion Asley GONZALEZ (CUB), former world silver medallist Jose ARMENTEROS (CUB) and Paris Grand Slam winner Otgontsetseg GALBADRAKH (KAZ). Mr. Mohamed MERIDJA, IJF Education and Coaching Director, made the opening address on behalf of the International Judo Federation. 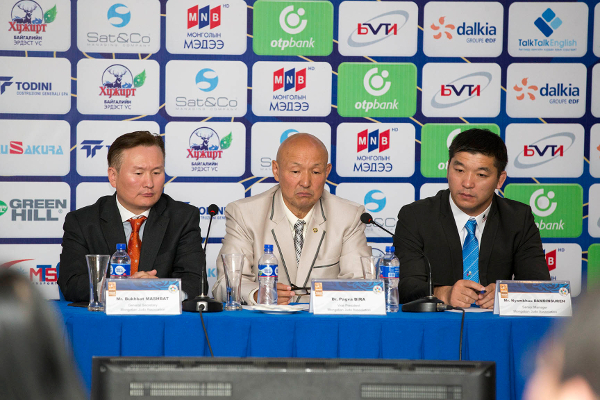 Mr. BATTULGA Khaltmaa, Mongolian Judo Association President, stated in the official outlines: “I would like to welcome all honourable guests, officials and athletes from all over the world to participate in the Ulaanbaatar Grand Prix. Dr. PAGVA Bira, Mongolian Judo Association Vice President and IJF Judo for Peace Commission Assistant Director, addressed the delegations in Ulaanbaatar on behalf of the organising committee. Mr. DORLIGJAV Dambii, Chairman of Organising Committee and Minister of Justice and Home Affairs, said: “On behalf of the organising Committee of IJF Judo Grand Prix, Ulaanbaatar is honoured to host the fourth edition of this great event. I would like to thank all IJF members who are supporting this tournament for many years. Click here to subscribe to the IJF notification service – login with your Facebook account and you can receive notifications when your favourite judoka or country is competing. Former world champion and Rio 2016 Olympic Games top seed MUNKHBAT Urantsetseg (MGL) wants to become her country’s first female Olympic champion in any sport. The 26-year-old has won gold at every level of the IJF World Judo Tour including her home event in 2013 and 2015. Almaty Grand Prix winner Otgontsetseg GALBADRAKH (KAZ), who will be seeded for the Rio 2016 Olympic Games, has had the measure of her former teammate MUNKHBAT in 2016 while All Japan Championships bronze medallist MORIZAKI Yurie (JPN) makes her third appearance on the IJF World Judo Tour (Tokyo 2013, Tokyo 2014) and will be hoping its third time lucky as she bids to earn her first honours for Japan on the world stage on day one. Former Junior World Championships bronze medallist UCHIO Mako (JPN) will be the top seed in the -52kg category for the first time. UCHIO, 20, took silver at the Jeju Grand Prix last year on her IJF World Judo Tour senior debut, and will be confident of claiming gold for Japan’s seven-strong women’s team. Former Ulaanbaatar Grand Prix bronze medallist CHINTOGTOKH Azzaya (MGL) will compete along with KWON Aerim (KOR) who makes her second start on the IJF World Judo Tour after making her debut a year ago at the same event. Judo is a family passion for former Asian Championships winner ISHIKAWA Megumi (JPN), whose dad is a distinguished coach in her native Nagoya and whose mum is a kata competitor. ISHIKAWA, 27, is a top-level talent but finds herself in Japan’s most overloaded category so competitions on the IJF World Judo Tour have been infrequent with this weekend being her first IJF assignment since the Tokyo Grand Slam 2013. ISHIKAWA has two Grand Prix medals to her name after winning bronze in Amsterdam in 2011 and in Dusseldorf in 2013. Rome European Open bronze medallist KIM Minju (KOR) will be intent on winning her first IJF medal this weekend as Asia could command this category among others. Asian Championships bronze medallist and world number 13 TSEND-AYUSH Tserennadmid (MGL) will compete for the eighth time this year when she takes to the tatami on Saturday. TSEND-AYUSH finished fifth at the World Judo Masters in May last time out and will be tipped to top the podium in her home event. Former Moscow Grand Slam bronze medallist BALDORJ Mungunchimeg (MGL) will have the same goal while former Asian Championships silver medallist NISHIKAWA Maho (JPN) could capture her first Grand Prix medal. Almaty Grand Prix silver medallist TSEND-AYUSH Naranjargal (MGL) will be the top seed in the women’s -70kg category on Saturday. The former Asian Championships winner will face opposition from former European bronze medallist Barbara MATIC (CRO) and 20-year-old IKE Erina (JPN) who finished fifth at the Tokyo Grand Slam last year and is more than capable of winning any colour medal at the Ulaanbaatar Grand Prix. Asian Championships bronze medallist PUREVJARGAL Lkhamdegd (MGL) finished fifth at her home event last year and will surely improve on that result this weekend. PUREVJARGAL won in Ulaanbaatar in 2011 when the event was a World Cup and will have to overcome judoka such as Junior World Championships winner Brigita MATIC (CRO) and Rome European Open bronze medallist PARK Yujin (KOR) to come away with top spot in her homeland. Olympic champion Idalys ORTIZ (CUB) is favoured to defend her Olympic crown this summer and will settle for nothing less than a convincing victory in Mongolia. ORTIZ, 26, has won the Almaty Grand Prix and World Judo Masters back-to-back to give herself the best chance possible of retaining her title as the top seed for the Olympics. Judoka such as former Ulaanbaatar Grand Prix bronze medallist ICHIHASHI Suzuka (JPN) will be motivated like never before to try and take a major scalp by beating the seemingly invincible Cuban which also can be said for former Lisbon European Open bronze medallist Ekaterina SHEREMETOVA (RUS). Former world silver medallist and top seed DASHDAVAA Amartuvshin (MGL) will be considered a certain medal source for the hosts when he launches his home campaign on Friday. DASHDAVAA, who won bronze at the invite-only World Judo Masters in May, has been overlooked for Rio 2016 with 20-year-old prodigy TSENDOCHIR Tsogtbaatar winning the backing of the MJA. 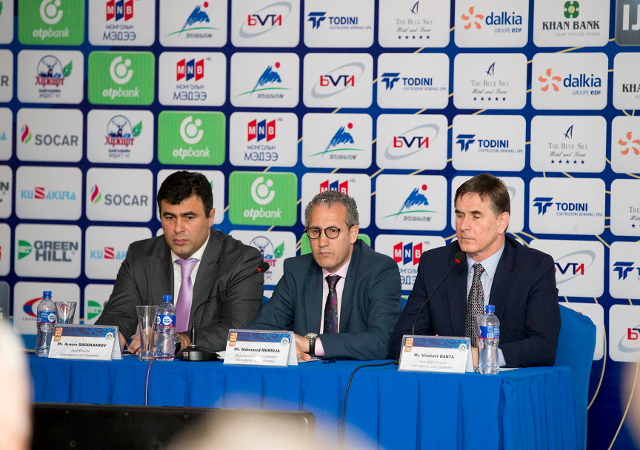 Orenburg European Cup silver medallist Rasim ALMAMMADOV (AZE) and former Buenos Aires Pan American Open bronze medallist Albert MONGUSH (RUS) could come into the equation if Mongolia are unable to repeat their four medals from four judoka as they achieved a year ago. Asian Championships winner DOVDON Altansukh (MGL) will be expected to lead the way in the -66kg category for Mongolia as the top seed. The two-time Grand Slam bronze medallist, who surprisingly lost his opening contest at the World Judo Masters in his last event, has the skills to potentially come away with a rousing win for his nation and will be a strong challenge for judoka such as former Baku Grand Slam silver medallist Vugar SHIRINLI (AZE), Prague European Open winner Andraz JEREB (SLO) and Tyumen Grand Slam bronze medallist Askhat TELMANOV (KAZ). Junior World Championships bronze medallist Martin HOJAK (SLO) occupies top seed status at an IJF event for the first time in his career. The 18-year-old has won the Tunisia African Open and is beginning to establish himself as a first choice member of his national senior team as he moves towards Tokyo 2020 at an accelerated rate. Madrid European Open bronze medallist Telman VALIYEV (AZE) and Wollongong Oceania Open bronze medallist Fagan GULUZADA (AZE) could both come to the for Azerbaijan. World number 15 NYAMSUREN Dagvasuren (MGL) will be the number one seed in the -81kg category for Mongolia as he looks to shut out international opposition such as Prague European Open silver medallist Jaromir MUSIL (CZE) and young Azeri Afig SAFARLI (AZE) who competes at an IJF event for the first time in 2016. Former Jeju Grand Prix silver medallist JUNG Won Jun (KOR) will be optimistic about his medal chances but NYAMSUREN appears to have all control of the category with four Grand Prix bronze medals on his resume. Rio 2016-bound LKHAGVASUREN Otgonbaatar (MGL) has won Grand Slam and Grand Prix gold over the last year to not only become his country’s number one at -90kg but also to qualify for the Games as one of the top seeds. The world number eight won on home soil in Ulaanbaatar last year and the home crowd will expect a repeat this year but London 2012 Olympic silver medallist and former world champion Asley GONZALEZ (CUB) will have other ideas as he looks to charge towards the podium in Rio de Janeiro in August. Former world silver medallist Jose ARMENTEROS (CUB) will be seeded at his first Olympics in Rio but first the powerful Cuban will look to steal the show in Ulaanbaatar on Sunday. Three-time Pan American champion ARMENTEROS will take some stopping when he competes in Mongolia for the first time as former Miami Grand Prix bronze medallist GAN Tuvshinjargal (MGL) and 17-year-old former Cadet World Championships runner-up Zelym KOTSOIEV (AZE) both hope to be competitive should such a contest materialise on Sunday. Former World Judo Masters bronze medallist BATTULGA Temuulen (MGL) won bronze a year in Ulaanbaatar and will better that result this time around. The two-time Grand Slam bronze medallist will fancy his chances of winning his second Grand Prix title while former Junior World Championships winner ULZIIBAYAR Duurenbayar (MGL) will also be out to turn a 2015 bronze into 2016 gold. Former Moscow Grand Slam silver medallist Dmitriy STERKHOV (RUS) could threaten Mongolia’s desire for heavyweight supremacy in the final gold medal to be decided in Mongolia.